Alphonse Penaud, a brilliant and tragic life. A brilliant and tragic life. 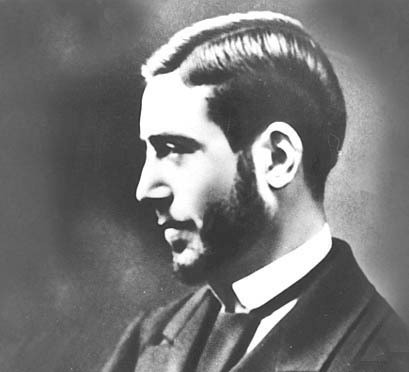 Extremely modest, possessing a great personality, equally brilliant in theory as well as in technique, Pénaud was certainly one of the most clairvoyants precursors in the dawn of aeronautics. Yet, Alphonse, the son of admiral Pénaud, born in Paris in 1850 was planning a naval career. It was a crippling illness that brought his creative spirit to develop an interest in the difficult questions about flying machines. In April of 1870, Pénaud invented a mode of propulsion, perhaps laughable today, but it was an invention that would provide a mean of performing small experimentation for years to come: it was the rubber band motor, built of twisted strands of elastic. The first successful application was a scaled model helicopter. Built of lightweight materials, this apparatus could climb up to the ceiling, and sustain flight before returning to the ground. Pénaud's obsession for perfection led him to have his apparatus built by Breguet, a clockmaker and engineer. The propellers blades made of paper were covered with gold platting to increase efficiency, and the smaller parts were constructed with aluminum. On August 18th 1871, he demonstrated that continuous flight was not a fluke. 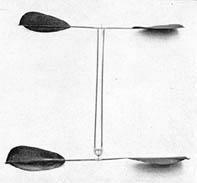 His "Planophore", a scaled model airplane was capable of achieving flights over a distance of 60 meters. It was a monoplane fitted with a stabilizing tail section. The rubber band motor drove either a tractor, or a pushing type propeller, depending on the model type. The characteristics of his machines, would remain for a long time those of future airplanes, and were truly advanced for the era. 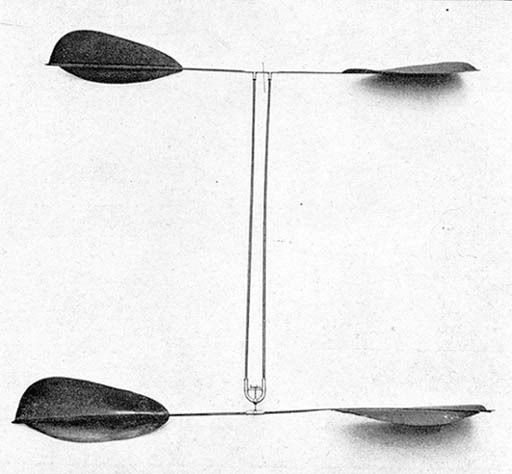 The fundamental flight experiments of the "Planophore" was demonstrated on many occasions, and endorsed by the members of the newly formed Société Française de Navigation Aérienne (French society of aerial navigation). Pénaud continued to study the laws of airplane longitudinal stability. To compensate for the effects of propeller torque, he installed additional weight on one of the wings. Later on, he resolved the torque problem with by twisting the wing's airfoil (known today as wing wash in or wing washout). Pénaud also developed other means of aerial locomotion, such as his machine with flopping wings, and he would also return to machines with rotating wings. Not ignoring the work of his predecessors, he revived and published the studies of Caley, another genius precursor. Between 1872 and 1875, he published numerous of his own studies concerning airflow around the machine, air resistance (drag), and the characteristics of gliding flight. We therefore owe Alphonse Pénaud the definition of aviation's three basic problems: air resistance - machine strength - and light weight engines. Going against the beliefs of the era which favored steam engines, (i.e. Clément Ader), or electric engines, Pénaud's faith in the all-new internal combustion engines was unshakable. His main concern however, was to resolve the aerodynamics problems of drag and weight. 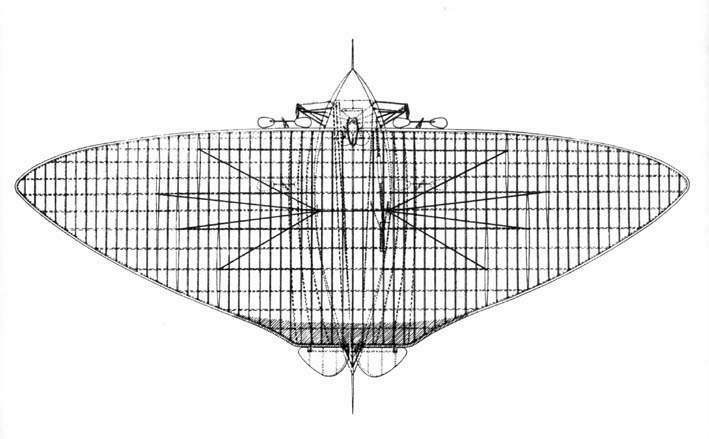 Where Pénaud demonstrated the true correctness of his visions, was in an airplane project which he developed in cooperation with Paul Gauchot. Let's examine and evaluate the characteristics of this machine for which an invention license was applied for and accepted in 1876. It was an amphibian monoplane, somewhat in the form of a flying wing, propelled with two variable pitch tractor type propellers. The wing's structure was planned to be built out of wood, or metal, with a type of covering contributing to strength. Initially, the first model's wing would have been equipped with struts, to be replaced eventually with a stronger cantilever wing. And, speaking of vision for the future: the machine was to be equipped with a retractable landing gear, fitted with compressed air shock absorbers. The fuselage was to be waterproof, wingtip floats, possibilities of being launched by catapult, and way ahead of its time, a single compensated control for pitch and directional control. Let's not forget that the year was 1876, twenty-seven years before the historic Kitty Hawk flight! Headrest aerodynamically shaped, windshield, relative wind indicator, bank indicator, anemometer, electric control of the elevators, and an indicator of air pressure on the wings. The list provided on this 1876 invention registration goes on and on. Alphonse Pénaud was not a typical businessman. Finding the necessary capitals to finance his enterprise was way out of his reach and depression soon began to ruin his health. He cut all ties with the Aeronautical Society, and when he was refused further help from anyone in 1880, he returned home and committed suicide. A macabre detail: before ending his life at thirty years of age, he enclosed all of his invention blueprints in a small coffin! Height: 28 centimeters. Diameter: 31 centimeters. Weight: 6 grams. Disregarding the strange shape of this machine, we must remember its extraordinary qualities in the year 1870.